Sanders closes to statistical tie with Clinton in nationwide poll. A new nationwise Quinnipiac poll puts Sanders two points behind Clinton -- in a poll with a margin of error of 4.5 points. In other words, since December he's gone from being 30 points behind to a statistical tie. 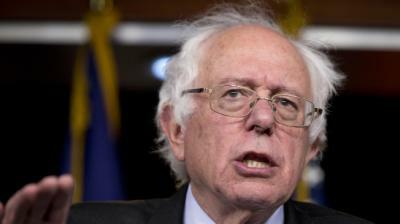 Sen. Bernie Sanders (I-VT) lags behind former Secretary of State Hillary Clinton by just two points, nearly wiping out Clinton's previous 31-point lead, according to a nationwide Quinnipiac poll released Friday. The poll showed support for Clinton at 44 percent, with Sanders close behind at 42 percent. This represents an enormous change since the previous national Quinnipiac poll in December, which showed Clinton beating Sanders 61 percent to 30 percent. The poll also shows Sanders doing better than Clinton in hypothetical match-ups with Rubio, Cruz, or Trump. So maybe the Dems are wising up about voter's rejection of Hillary Clinton.